Liquor products for sale at home and imported liquors will be required to have stamps and labels on their packages, except for manually produced liquor products sold to enterprises with industrial liquor production licenses for further processing. 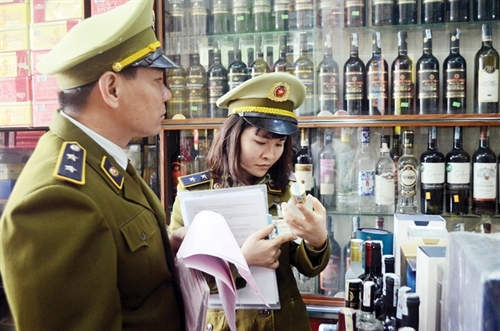 Under Government Decree 105/2017/ND-CP, which will take effect on November 1, since liquors belong to the group of goods subject to conditional trading, those that conduct mass and small-scale production of liquors for trading, liquor distributors, liquor wholesalers and liquor retailers are required to possess licenses prescribed in this Decree. Meanwhile, small-scale producers who sell manually made liquors to enterprises with industrial liquor production licenses will have to register their business with commune-level People’s Committees. Liquor products subject to no technical regulations must be announced to be compliant with the food safety regulations and have food safety regulation conformity documents registered with competent authorities for market sale pending the issuance and entry into force of relevant technical regulations.